iPhone Repair Sydney iPhone Specialist Google Ranking Number 1 - Most Trusted IPhone Repair Specialist. Iphone 3GS/4/4S/5/5c/5s, IPAD 2/3/4, Mini, Air, IPod Touch 4. Nobody can fix it? Bring It On. iPhone Specialists are so proud of your great supports. 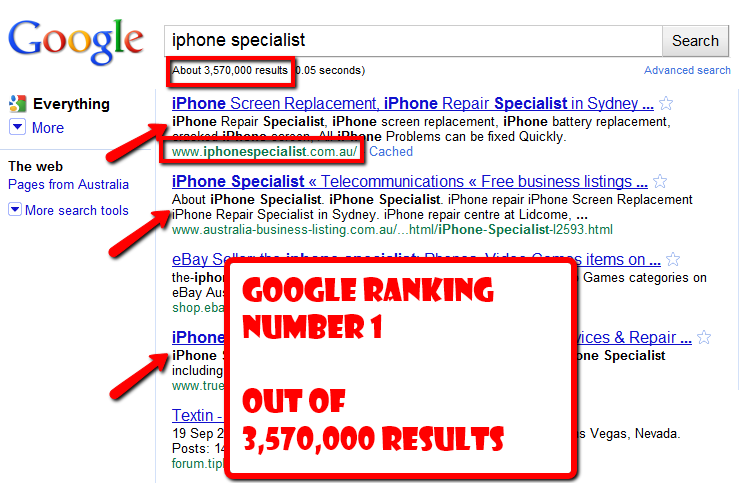 Currently iPhoneSpecialist.com.au is Number 1 Out of 3,570,000 Google Australia Search results. As you know, the most sophisticated Google search algorithm doesn't allow any website to put on the top. Only the one Truly Popular website by real people can be on the top ranking out of thousands websites. Yes, iPhone Specialist Great Services are Proven By Google Australia. Yes, Definitely Our Existing Customers are real evidences. You can click here to see more testimonials what they are talking about iPhone repair Sydney Specialist. Now you can check this - Go to http://google.com.au/ and find us. or simply click here.